The CCGS Sir Humphrey Gilbert at sail, 1980s. The need for Canadian icebreakers was realized during the early 1900's to manage ice flow along the St. Lawrence River. During the winter, ice would jam up the river between Montreal and Quebec City, creating a natural dam and causing flooding in the area. During the spring thaw, the free ice would rush down the river and damage ships and smaller vessels moored along the shore. Ships that could break up the ice and keep it moving were the solution, and so the first icebreakers of the Department of Transport's Marine Service were created. In 1958, the newest vessel of the fleet, CGS Sir Humphrey Gilbert slid into the water near the Davie Shipbuilding yard in Lauzon, Quebec. The light icebreaker was commissioned in June 1959 and joined the Marine Service fleet, and was then transferred to the newly formed Canadian Coast Guard in 1962. Although she was registered in Ottawa, her home port would be St. John's, Newfoundland for the remainder of her career. During the winter and spring, she was used for clearing the ice that clogged various ports and seaways in the area. In the summer and fall, she acted as a buoy tender, laying and collecting research and navigation buoys for the Coast Guard. The Sir Humphrey Gilbert/Polar Prince moored in Clarenville. In 1963, the Sir Humphrey Gilbert was called to respond to the French vessel Douala off the coast of Newfoundland. The boat was in danger of foundering, and the Gilbert was already en route to another vessel and was able to detour. Unfortunately, one of the barges on her deck came loose and the icy conditions meant it took longer than usual to secure it. By the time the Gilbert arrived on site, the Duoala was gone. 19 members of her crew were taken on the Gilbert and brought to Newfoundland, with two dying on the way. 13 men from the French ship died in the icy waters. Removed from service in 2001, the Sir Humphrey Gilbert was submitted to Crown Asset Distribution and put up for sale. 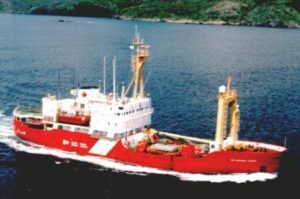 Puddister Trading Co. Ltd. out of St. John's purchased her, and renamed her the M/V Polar Prince. Unfortunately, they didn't have any grand plans for her, and in 2002 she was sold again, this time to Star Line Inc. She was docked in Clarenville for the next couple of years until Star Line put her up for auction on eBay in 2005. After that failed, she was eventually sold privately to GX Technology Ltd. in Calgary, Alberta. This was a turning point for this older vessel. GX Technology had the vessel refitted, with the latest technology installed under her 1950s esthetic. From there, she was put into service as a commercial ice breaker, hired out to assist in situations where required. The C3 moored alongside in St. John's. Nowadays, she has become a nationally recognized ship for a different reason. 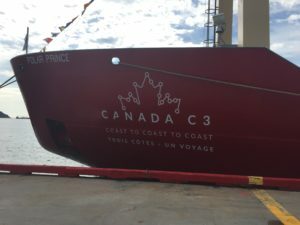 Temporarily sailing as the Canada C3, she is currently in the process of travelling around Canada, visiting stops along all three coasts. The trip has been broken into smaller legs travelling to indigenous communities as well as urban ports. Carrying with her a civilian crew of scientists, artists, musicians, and members of the public, her purpose is to help Canadians gain a better understanding of this remarkable country that we call home. She was in St. John's from June 11th and 12th, but was only open for tours from 9am-1pm. Never one to miss an opportunity to check out a vessel in the harbour, I managed to jump in on one of the first tours of the day on the 12th before I headed off to work. Our group's tour guide, Ellie, was delightful and very informative. She introduced us to the ships purpose and lead us around to all the highlights of the vessel. Our first stop was to the well deck, where we were lucky enough to be able to peer into the cargo hold. Usually closed during previous port stops, it was open because this was the last port where they would be able to take on a large amount of supplies before heading for the north. The cavernous space opened up to show pallets of food, large freezers for bread and perishables, bags of supplies, various types of equipment and other necessities for a long trip at sea. From there, we travelled across the deck towards one of the container labs. Placed on deck, these small compartments were completely outfitted with everything needed for this particular science team, which was a group of scientists from Fisheries and Oceans and the Canadian Museum of Nature. Two of the scientists happened to be on hand and were kind enough to talk about their experiments with us. Inside the container lab. Cramped corners, but lots to be done! This experiment was analyzing environmental DNA - the cells shed by sea creatures and mammals in the areas. Containers are lowered and collect 2 litres of seawater. The water is then filtered down to its most basic properties, and those are analysed. This analysis can tell the scientists what creatures - native and invasive - are in that particular area. These results will be used to help map the biodiversity of Canadas three oceans, and they hope to have the first batch of results available as early as this December. Other onboard projects have also included testing for micro and macroplastics, collecting samples of plants to track biodiversity on land, etc. In order for a project proposal to have been accepted, the topic had to contribute to the scientific understanding of Canada, be able to be completed in minimal time and minimal space, and be related either to specific legs of the trip or the journey as a whole. You can learn more about the scientific studies and experiences being done on board here. Our tour continued into the vessel itself, with our first stop being one of the two mess halls on board. 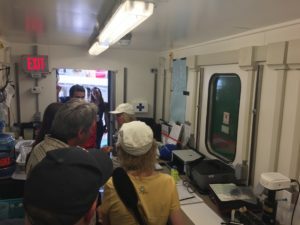 Due to the size of the crew (14 ship's crew, 20 expedition team members, 22-24 participants) they have created two separate mess halls so everyone can be fed. On the chalkboard-painted wall was a chart with various chores written out. Ellie pointed out the "F" that dominated many of the squares and told us that Fred Penner was currently winning on chores that he was responsible for. My inner child had a momentary fangirl moment, I won't even lie. From the mess hall, we travelled to "The Knot". Named after a favourite bar in Lunenburg, Nova Scotia, The Knot was a communal gathering space with a self-serve snack corner, comfy seating, games, books, and other items. Ellie explained that some of the musicians would sometimes join together here and have jam sessions, or groups of passengers would just gather and chat. In the far corner was what was called "Comfort Corner". Because of the ice breakers tendency to roll more with the waves, this corner was outfitted with sickness bags, anti-nausea medication... anything one could possibly need while waiting for the world to stop spinning, or your body to stop heaving. Across the hall and down a little way from The Knot was the "Gord Downie and Chanie Wenjack Legacy Room". A library and common space where Indigenous and non-indigenous Canadians could gather and discuss topics such as reconciliation and community, the room is decorated with various pieces of indigenous art that had been gifted to the expedition by the communities they had visited. You can learn more about the Legacy Room here. We travelled from the Legacy Room to the flight deck. The helicopter hanger that had served to launch many rescue missions during her Coast Guard days had been changed into a large gatehring space. Ellie explained that this was one of the only places on the ship where everyone on board could gather. Long tables would be set up for team meals, and the bar and seating meant that it was a good place for everyone to unwind during port visits. On the stern was what she said is "the best stage in Canada", where musicians and other performers are able to showcase their talents for the diverse crew. The "best stage in Canada". Inside the helicopter hangers were numerous canoes from different groups across Canada (including the Canadian Canoe Museum - shout out to Peterborough, ON! ), built using traditional methods. Ellie said that the canoes are considered to be a metaphor for the state of Indigenous/Canadian relations. "We want to be a nation of canoes, but need to be heading in the same direction". Our final stop was the bridge. Still looking as good as she looked in the 1950s, all the tech has been updated to modern standards, but with the traditional charts and maps tucked over to the port side. Ellie talked about the small steering wheel and the backup steering methods used if those fail. She said any of us who wanted to could pose and take a picture at the helm. So, of course I couldn't say no. You can see that picture, along with the other shots I took of the Canada C3 at my brand new Flickr account. Head on over and check them out! The tour was great, and it was a blast to get on board and check out this incredible ship. As she heads to the Arctic and onward to the West Coast, I hope all the participants enjoy this unique and wonderful experience. Safe sailing!